Big Brewsky in Sarjapur is a lifetime in a cab away from Jayanagar (blaming it entirely on Bangalore continually degenerating traffic scene) and so despite hearing a lot about it, I never really got myself there. And then, life goes and makes it impossible not to head there when I heard that The Chef Saby Gorai was redoing the menu. I have heard a lot about Chef Saby and on a recent visit to Delhi, Rajiv Singhal, a friend from the industry couldn't stop gushing about Lavash and I so regretted not having the time in my short visit to try and make it there (mental note to self made for next visit). So here we had Chef Saby, coming to Bangalore, reworking a menu and I bravely sat through the traffic to get to Big Brewsky to try it out. Right of the bat... Big Brewsky is an awesome place - a 3 floor space overlooking a large Koi pond and an expansive bar. Atop this bar sits a lovely stage for live performances (Sudhakar, along with One Girl Shy recently performed there and I went in for the Sunday brunch too. Mentions of that in this post as well). Lots of sunlight, lots of greenery and lots of selfie potential! So let's dive into the food, because there was a lot of it that made its way into our ever expanding bellies that day. 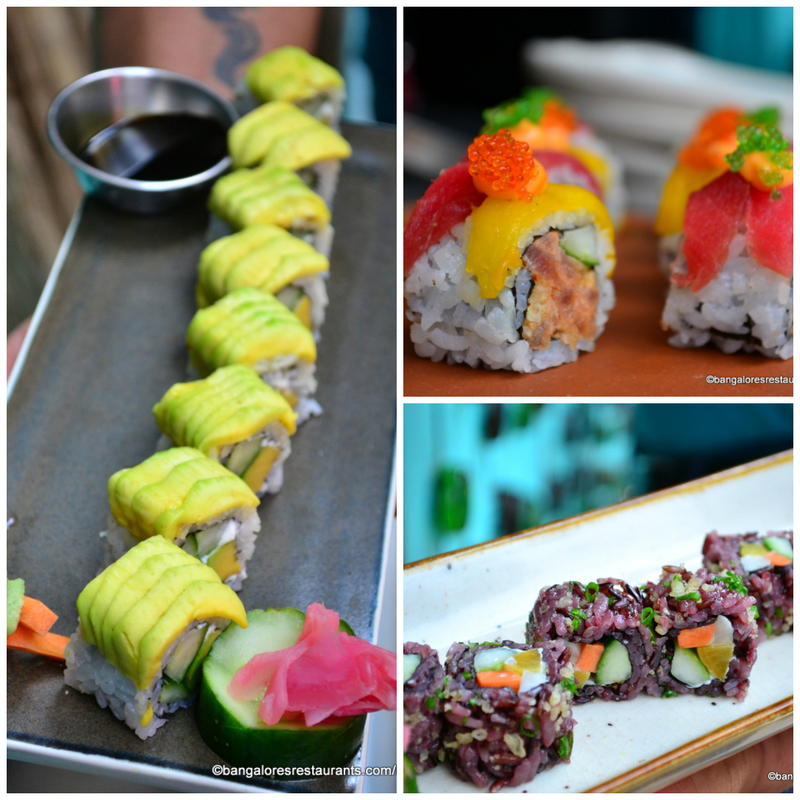 For sushi suckers like me, Chef Saby's sushi collection is all that I need to make me a happy puppy. In the picture you see the Avocado Maki Rolls to the left (fresh, perfectly rolled and a great choice for the vegetarian); The top right is the Non-Veg California Roll stuffed tuna and topped with slivers of tuna and salmon roe, and if I am not wrong, seaweed styled into roe with that lovely green colour and a crunch to match. The Black rice, Vegetable California Roll is both a visual treat as well as tasty one. There was also a Tempura Prawn Roll that was great. I could spend a lot of time with these babies. 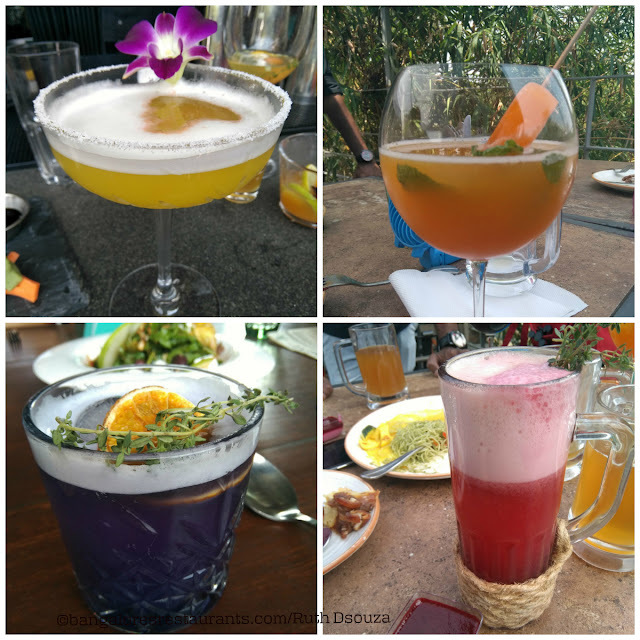 If Chef Saby was rocking it in the kitchen, the bar was whipping up some interesting things. We started off with the Punch - a classic mix of 5 ingredients and in this case Gin, Elderflower, berry juice, citrus and spice. 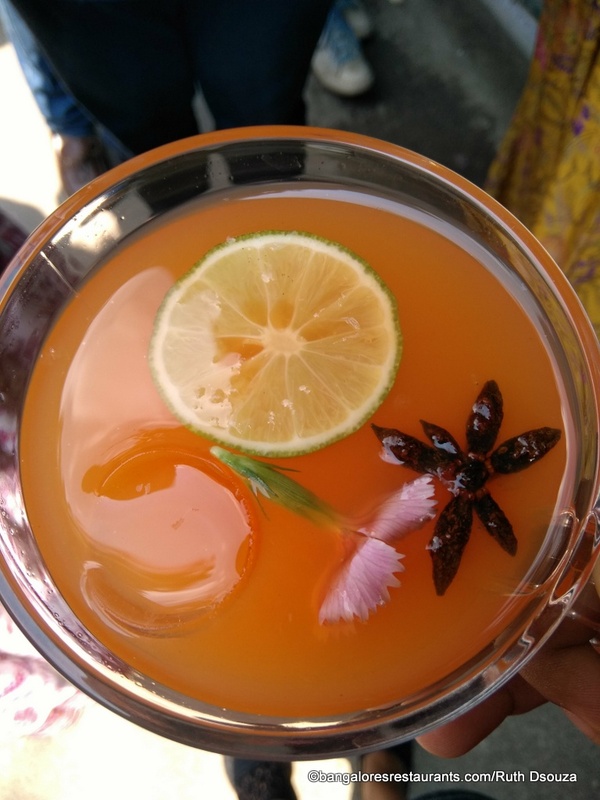 Well balanced, pretty in a glass and the perfect drink to have in your punch bowl. The Yellow Jacket (top left) Bourbon Whiskey, house made turmeric syrup, lemon juice and egg white as an emulsifier. The Great Pretender - Tequila, tropical juice, home made purple syrup, egg white, fresh lime and thyme. We also visited Big Brewsky for the Sunday Brunch and Karthik was kind enough to whip up some beer cocktails for us - the first (top right), beer with an orange chusky and the one below was a watermelon based one with a jammy syrup - perfect for a dessert drink. Now getting back to the food - Hot Black Prawn - Prawns with the tail on, wok tossed in hot garlic sauce is just what you need to pair with your beers on a hot afternoon in Bangalore. Spice and soy levels ensure you have the right mix of salty and hot and there is nothing more you could really want from these juicy fellows. A few rounds of this were brought on. 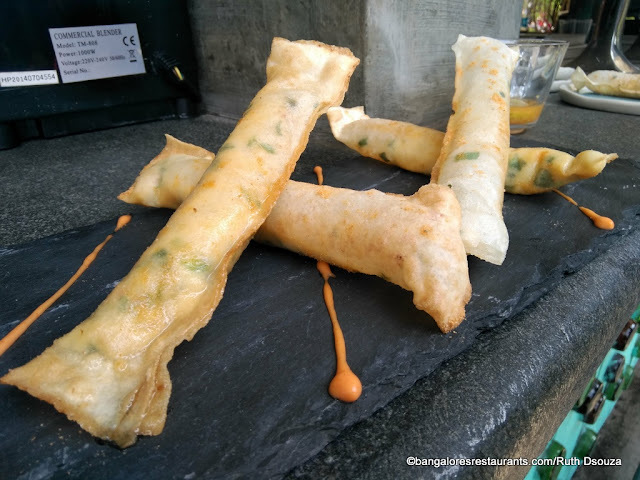 Chilli Cheese Roll - for when you want feel good-wala grub with your drinks. How can you not love crispy fingers stuffed with molten cheese, naga chillies, and herbs! I have very rarely seen crystal dumplings get done right in the city. 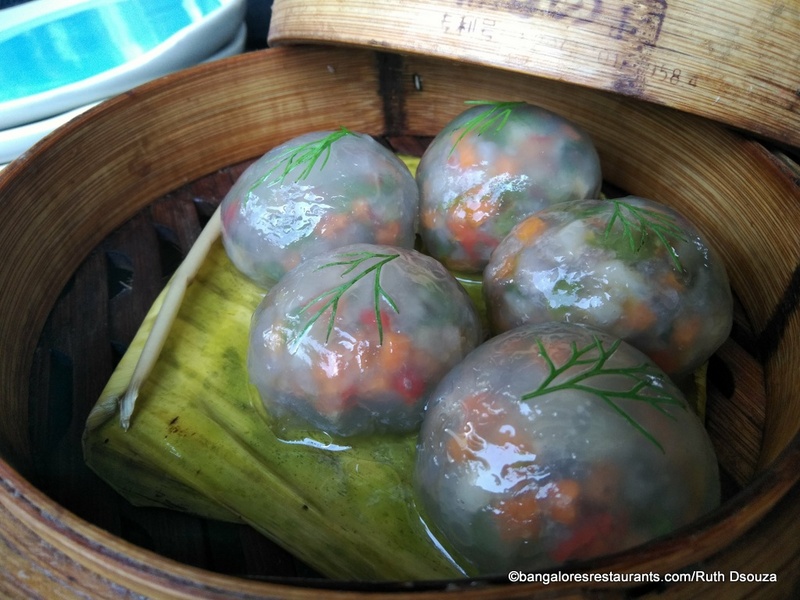 Just the right level of translucent to give you a sneak peak into the stuffing, which in the case of this Shine Vegetarian dumplings was lotus roots, bell peppers, carrots and coriander - refreshingly not run-of-the-mill. The veggies retained their crunch making the soft exterior such a complementary mix of textures. 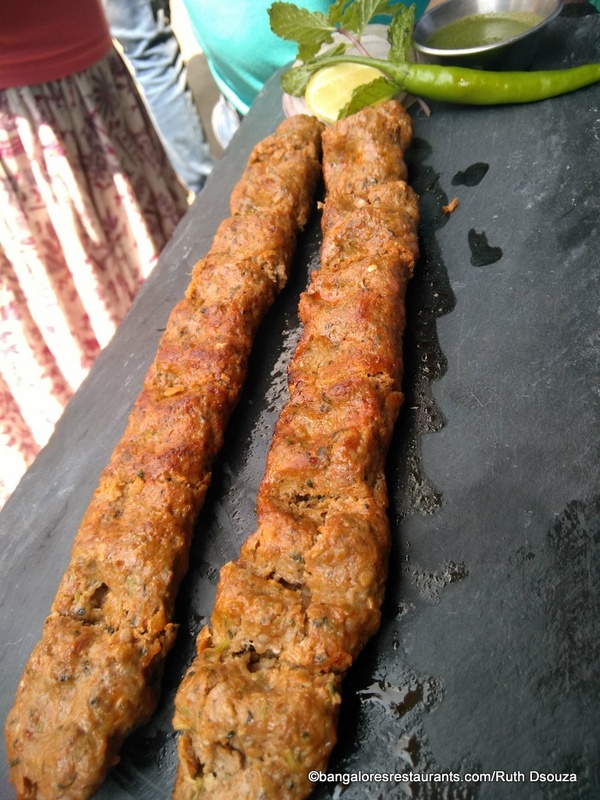 I love the Iranian Koobideh and this version of the Iranian Seekh Kebab was spot on. 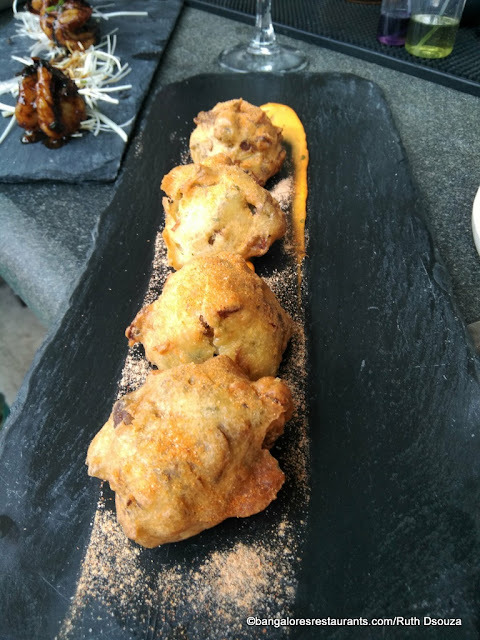 I shamelessly broke away bites with my fingers - succulent, soft meat, spiced mildly yet packed with flavour. Thin Crust, wood fired - The Garden City Pizza is a tribute to Bangalore the Garden City (though I would beg to differ on the garden part) - Roasted Bellpeppers, broccoli, zucchini, corn and that topping of Argula. Stupid grins of happiness are but natural. 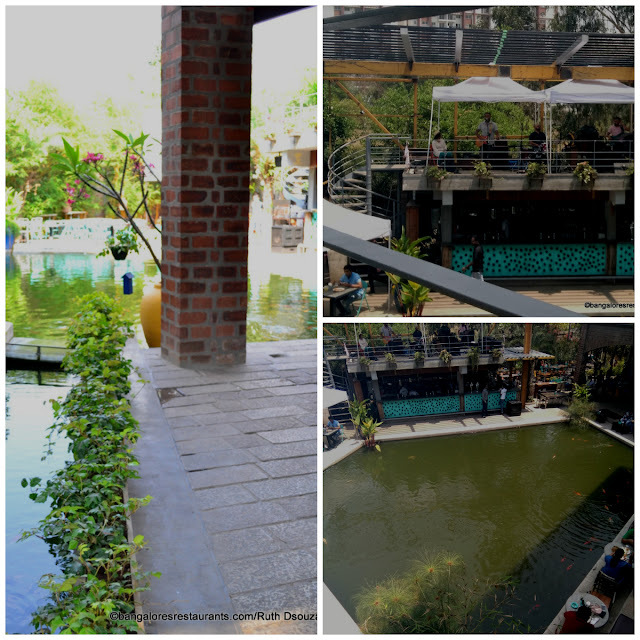 And the you go and bring out a slate slab of Stir fried Beef chili, wok tossed with capsicum soy and chilli, morsels of which yield very easily to the fork and knife - and I finally scoped out a nice spot between the Koi pond, bar and the brew tanks to pitch a tent! This was a very refreshing substantial salad that found its way to the table. While it was great as a whole, each one of us loved a particular element in it and that is how the salad was demolished. - Apple Sundried Tomato Salad - Mixed fresh greens, farm fresh apple, feta cheese, kalamata olives and sun dried tomatoes. Chinese Bird's Nest - A Chiffonade of potato nest with crunchy vegetables. The beauty of this was in slicing it down the center and it giving way to the vegetable filling. Quite the Instagram friendly dish and a good one for the tummy too. The Bacon wrapped grilled chicken breast with Layonnaise, cheese and nuts. A nice meal in itself, with good quality bacon around a chicken breast that does not end up being that fibrous mess. The jus on the side and the blanced veggies make for a happy tummy. For the risotto sucker that is me - this is just the dish you can serve me and I can go home satisfied. A really beautifully done Black Rice Mushroom risotto of black Arborio rice slow cooked with mushroom pate and parmesan, truffle essence. Moving on the desserts, which has never been my cup of tea anywhere, except for a few teaspoons. But from the little that I did down this Asura's Devil Chocolate mud cake layered with dark chocolate, cream cheese and chocolate frosting is the reason you can meet your maker on a nice high. Chocolate Fondant - Dark chocolate lava cake and vanilla ice cream. This new menu by Chef Saby packs quite a punch, which I sincerely hope remains the same even when he is not in the kitchen. Big Brewsky now has the ideal mix of great food, great ambience, some really good drinks and great live music too... the beers may need a little tweaking to make each one have a distinct identity but the place certainly rocks it now. Soon after this meal we headed there for the Sunday brunch which does not feature the a la carte menu you see here but offers a great spread which you can opt for in three packages - the food, a beer based package and a hard liquor package. The spread includes the works-anytime mix of chaats, kebabs, pastas, pizzas, sushi, biryanis and dessert. 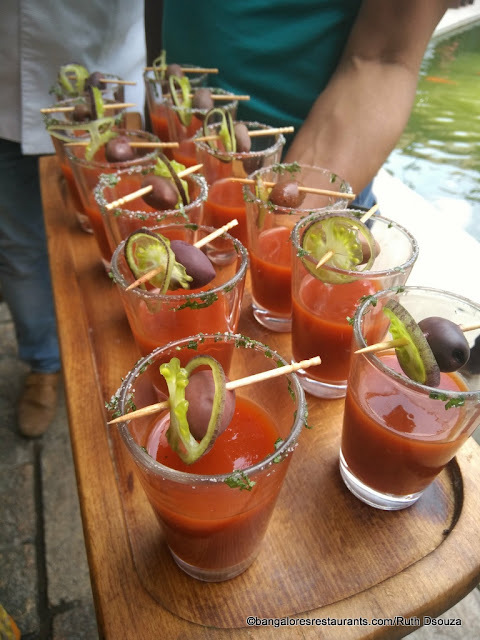 The service for a packed house that day was quite good and the pricing at Rs 1350 for the beer brunch is good on the wallet.For the a la carte you are looking at approximately Rs 2500+ for two which is a good deal for the experience you get. The loos are clean though on housefull days you may have to wait a bit.